Hello there! 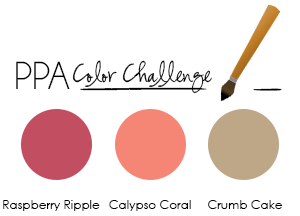 This week's challenge over at the fabulous Pals Paper Arts is a color challenge, take a look at these fun colors, grab your supplies, create something colorful and head on over to the PALS and link up your creation by next Thursday, can't wait to see what you come up with! At first I had no idea what I was going to do, but after perusing my stash of stamps, I found the Ronald McDonald House stamp set Moving Forward that we got at the SU convention last summer, it was just begging to be inked up so out it came. The trike was stamped then cut with the windows collection framelits, paper pierced, and blinged up. It turned out super cute. 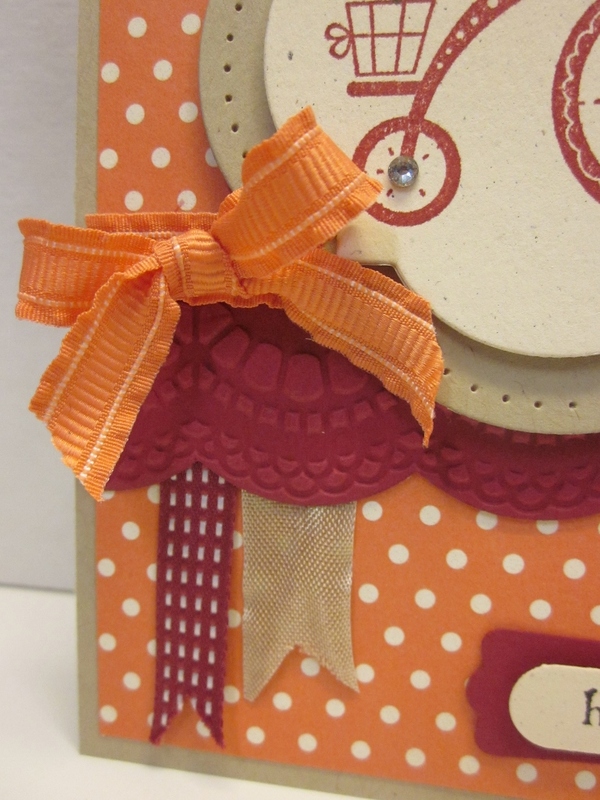 Some matching calypso coral ruffled ribbon makes a cute accent bow. I added matching ribbon in raspberry ripple and crumb cake, and trimmed each in a flag cut end. The background DSP comes from the new Tea for Two DSP, and provides a great pop of color. I only wish now that I embossed it first with the framed tulips EF, that would of been a neat touch. This decorative edge was made by first cutting the card stock with the large scallop edgelit, then embossed with the delicate designs embossing folder. It is such a pretty addition, so feminine and delicate. The sentiment was stamped using the same stamp set then punched out with the word window punch, then layered on a modern label punch. 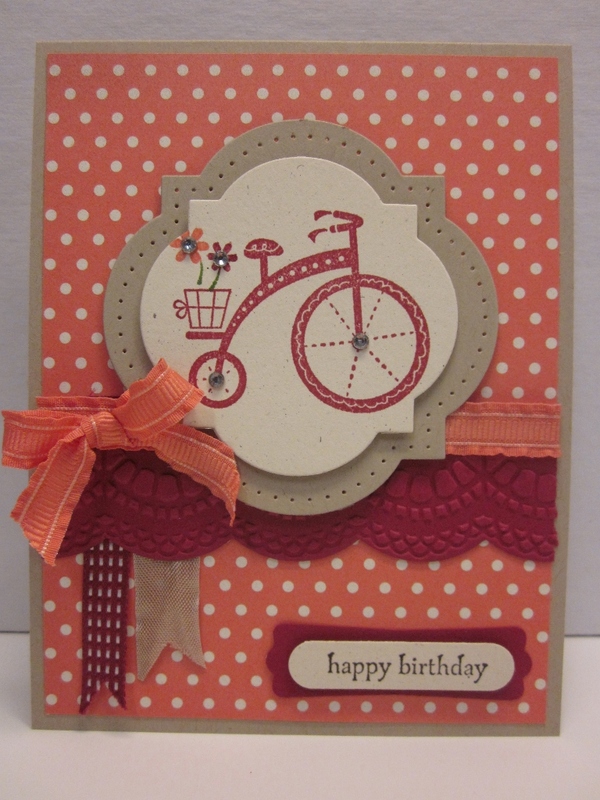 This is a lovely birthday card that can be made quite easily and in multiples, and it can easily be mailed, which is a plus! Thanks so much for stopping by today, I hope you were inspired, enjoy! Wow what an interesting color pallet! I love it! And of course, your card is fabulous! Really cute, Sandie! Love the way you used Moving Forward for the challenge! All the details are delightful! fresh and fabulous. love the layout! Wow....awesome card! 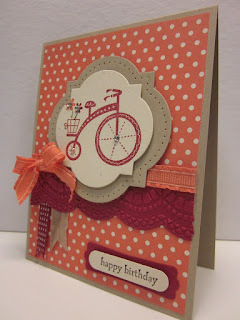 I just love the bike and the embossing really does look feminine and makes the card pop.. Thank you so much for sharing. 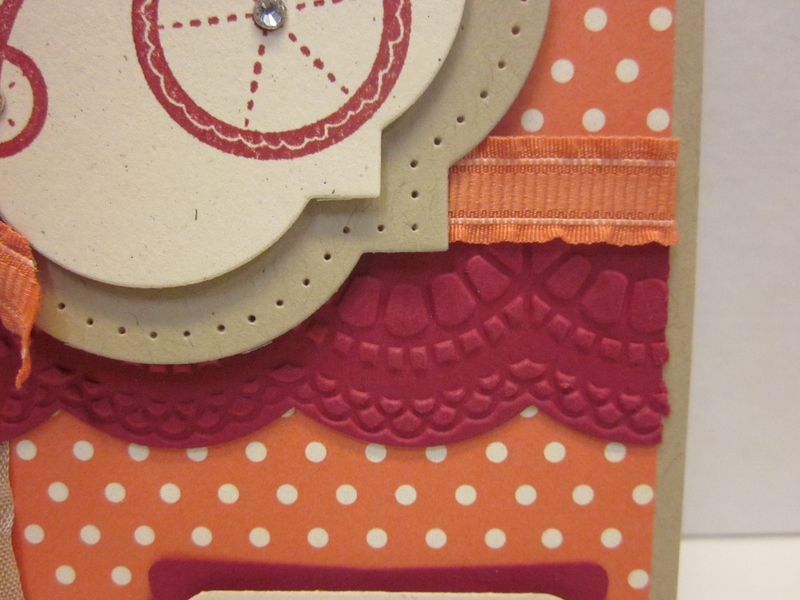 Just darling, love the use of that graphic on that die cut and colors pulled together so well. This card is fun! Love all of the sweet details - and you framed the tricycle perfectly! Love the design lay out of this card. 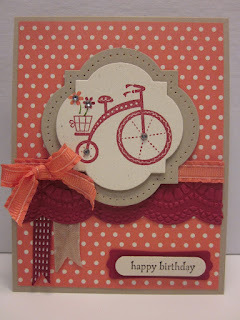 the bicycle is such a fun touch! Terrific textures and love those ribbon banners! I didn't think of using that DSP!! Beautiful, Sandie! You did a fabulous job incorporating the challenge colors. So many fabulous details on this one, for sure! Such a cute card, Sandie! 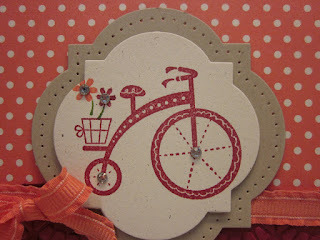 I love the tricycle paired with the polka dots!